We all love to spend time in our gardens, but how often do you “shop” your garden for cut flowers? Most of us have wonderful flowers and foliage every day of the year that can be re-imagined as cut flower arrangement for friends, special events, and of course our own homes. We all know that most of the cut flowers offered for sale at the florist or the grocery store are flown in from another continent. There are far too few growers here in the United States. So just as grapes from Chile and oranges from Israel come with a “carbon cost”, so too do the pricey stems at our favorite florist. Besides, when is the last time you smelled a deliciously sweet flower out of the florist’s cold storage? Most flowers on the market have been hybridized for size, color, and staying power. So many lost their fragrance along the way. Like locally grown tomatoes, there is just something very special about locally grown flowers. And you don’t need a special “cutting garden” to have a good supply of flowers and branches to cut. You just need a little planning ahead and creativity. 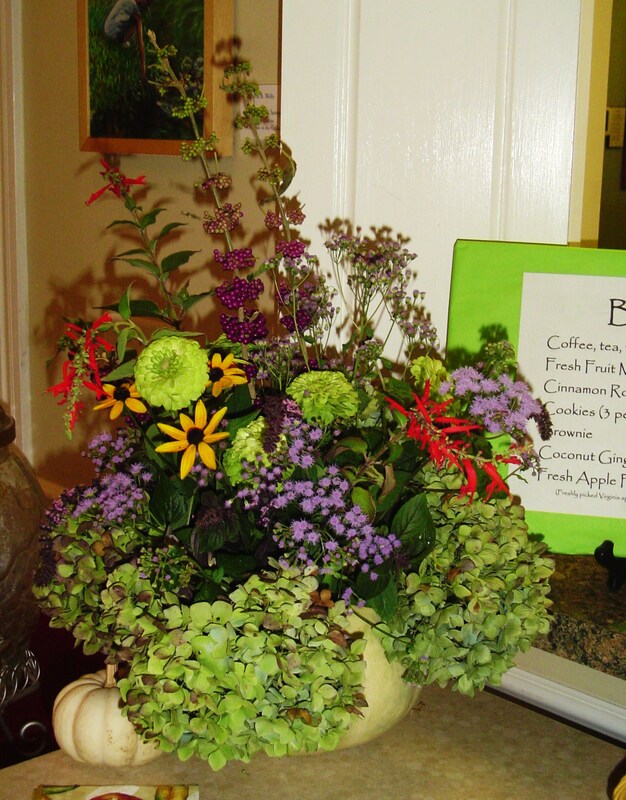 This arrangement began with a desire to use the Beautyberry which is so intensely beautiful at the moment. It is beautiful on its own in a vase, or mixed with something tall and airy, like Dill. After reading the new Country Gardens magazine, I was inspired to use a pumpkin as the base for this little arrangement. To prepare to “shop” your own garden, prepare a clean container with warm water. The stems take up warm water faster than cold, and so are better hydrated. 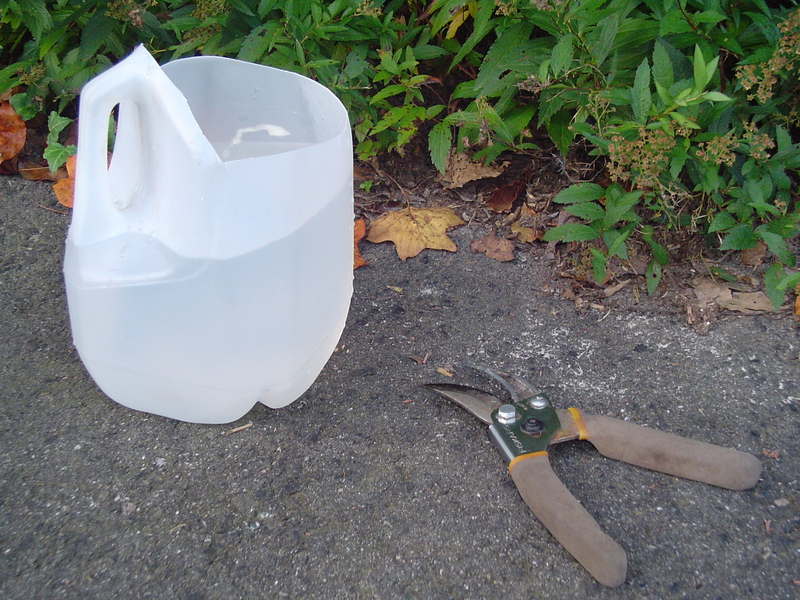 This is a gallon jug, rinsed, and cut to make room for lots of stems. I added a few drops of honey, which not only feeds the blossoms, but also helps control bacteria in the water. The other important tool is a pair of sharp pruners. Since I gather woody branches as well as herbaceous stems, the pruners work better than scissors. First walk around to see what might be in bloom. 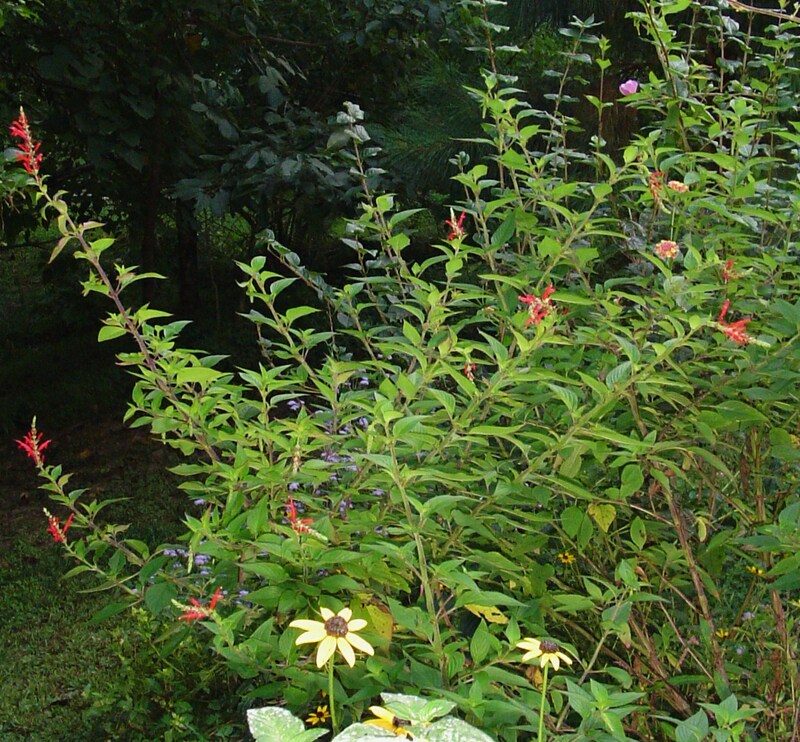 I was delighted to find that the Pineapple Sage had finally bloomed. A few hydrangea blossoms sheltered under an other shrub were still fresh enough to cut. Queen Lime Zinnias growing with Rudbeckia and African Blue Basil. 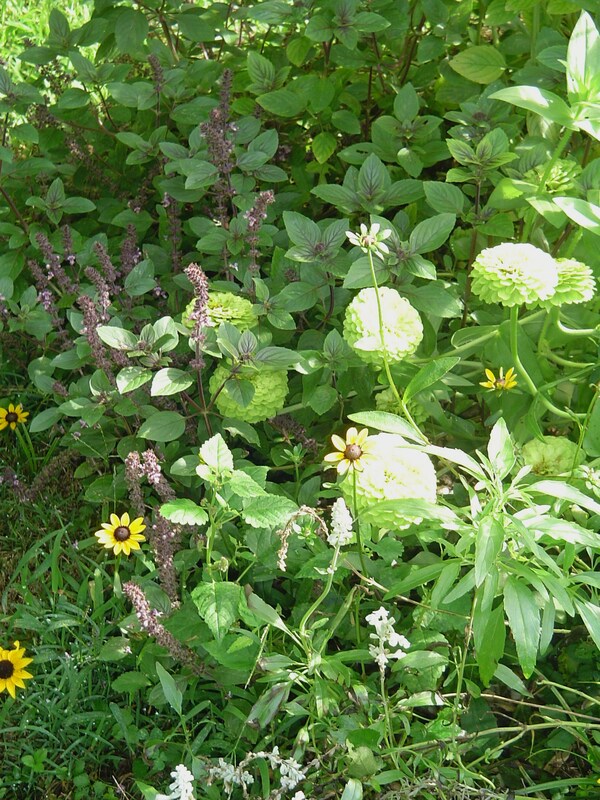 I have an abundance of Rudbeckia, Queen Lime Zinnias, Basil, and Ageratum. I also had lots of white Lantana, flowering dill, mint, and some chrysanthemums about to open. 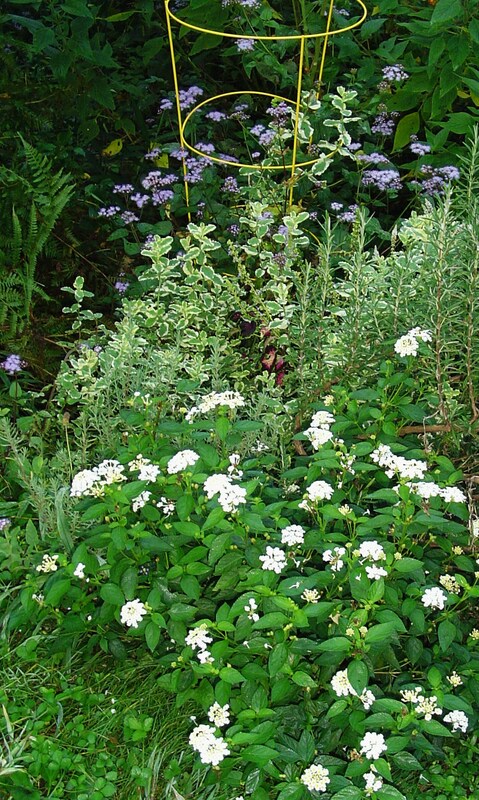 Herbs are a wonderful choice for foliage and filler, especially if the herbs are also in bloom. One must pick and choose. The flowers I cut actually ended up as two separate arrangements yesterday morning. Rudbeckia, Ageratum, and a little red pepper I cut, but couldn’t use this time. 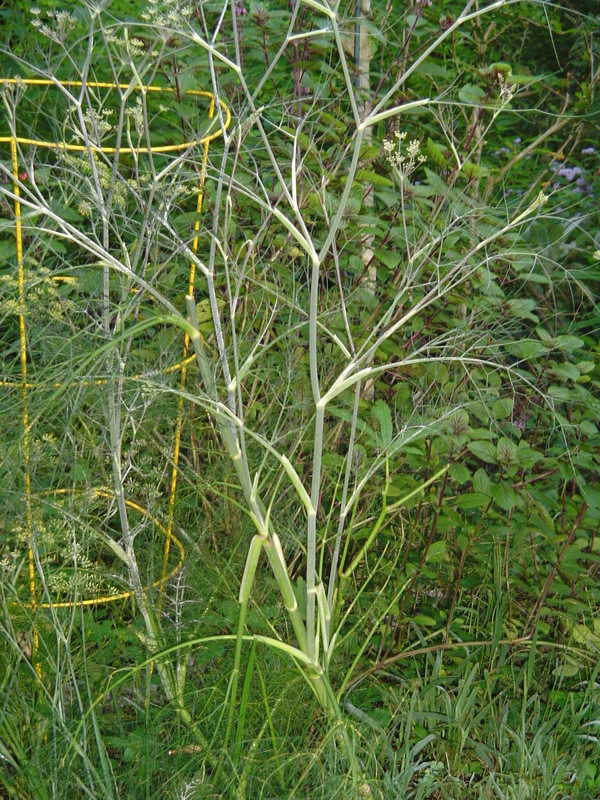 Once deciding what to use, cut long stems, and remove all of the lower foliage. 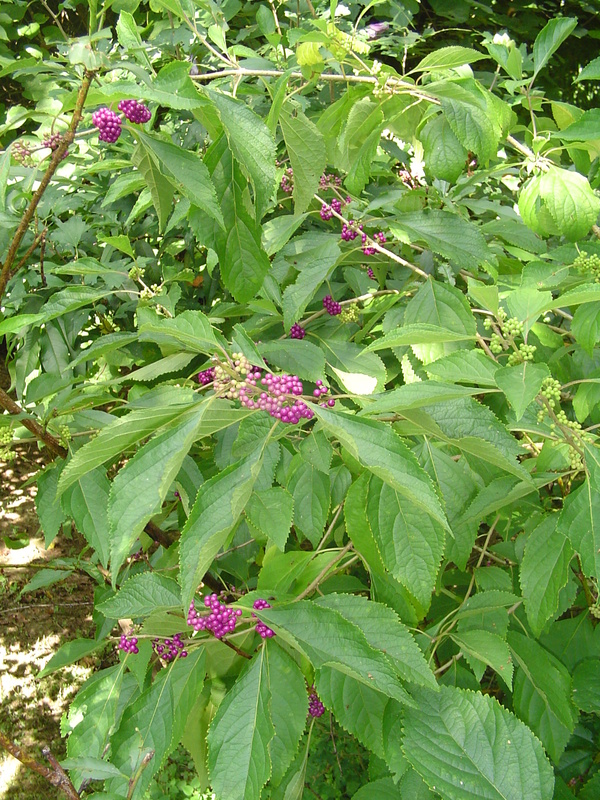 Beauty berry still has all of its leaves, but they should be removed when you cut the branch. The branch is more striking with just its berries. Cut as early in the morning as you’re able, and allow the stems to rest in deep, warm water for several hours. Cut more flowers than you think you’ll need. I almost always head back out into the garden part way through for more of something. Extra flowers can be made into something small and will always be enjoyed by someone. Pineapple Sage has just come in to bloom. To use a pumpkin or gourd as a container, first study it to determine how it sits, and what side is best. You don’t have to cut it “Jack O’lantern” style. The hole you carve can be off-center. You can make a series of small holes around it and place just a few stems in each opening. The pumpkin can be stacked in a basket, pot, urn, or on a larger pumpkin. It can be set in the midst of grapevines. I chose some little white companion pumpkins to go with my larger white pumpkin. After opening the pumpkin, and removing the seeds, decide whether you want to hollow it out a bit and place a plastic or glass vase inside, or whether you prefer to work in crumpled chicken wire or oasis. Oasis, like Styrofoam, is controversial since it is a chemical product. It is what I happened to have on hand, and so I secured a half-round, pre-soaked, into the body of the cleaned pumpkin with wooden skewers. 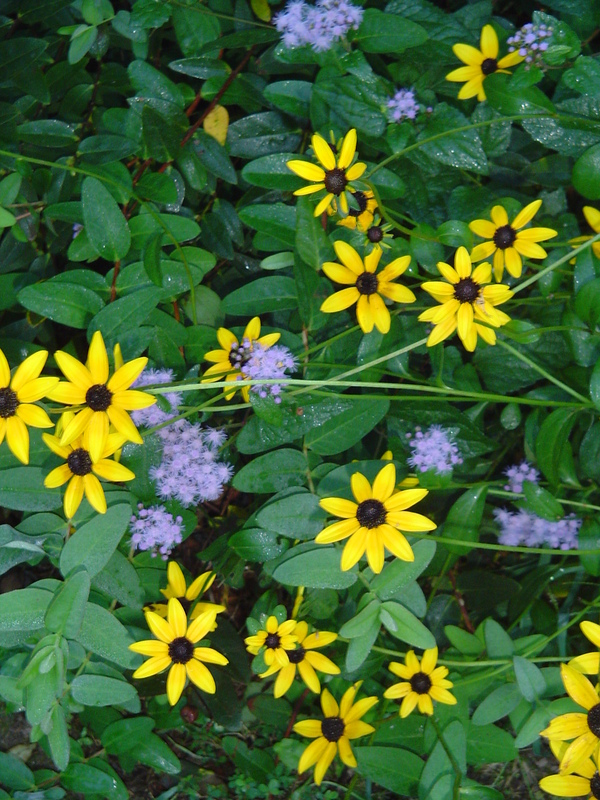 Take inspiration from how your flowers blend in the garden. 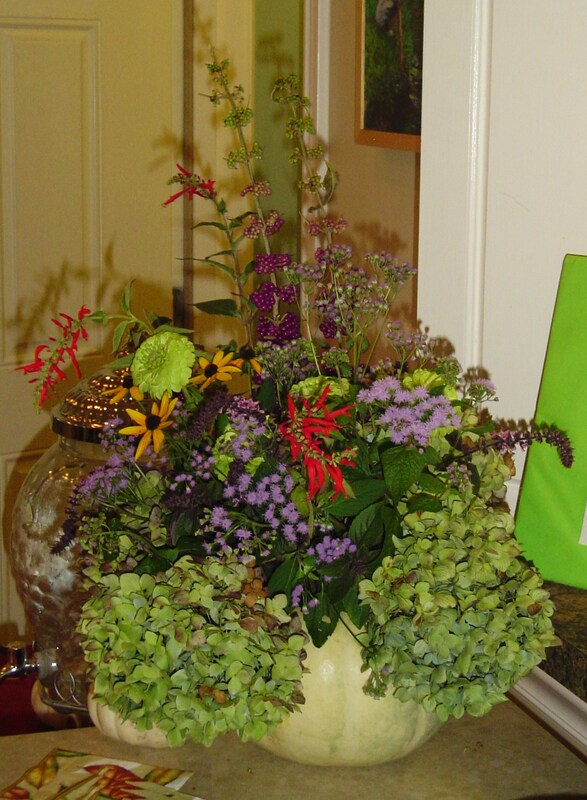 Beautyberry, at its peak, is the inspiration for this arrangement . you know it is complete. We had a special event in our community this weekend. 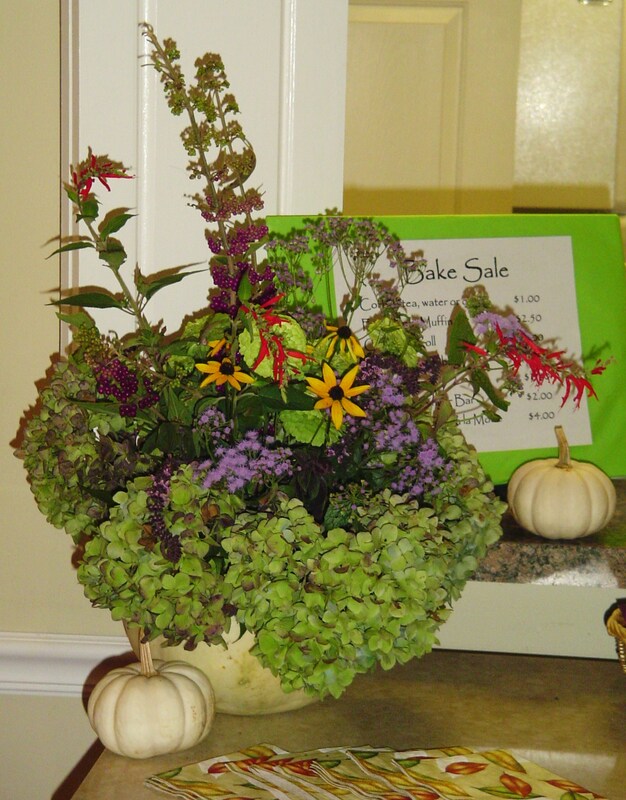 Friends from our garden club made many beautiful silk arrangement to decorate our “Boutique Sale,” which were also offered for sale. They were elegant and beautiful throughout the room. My little pumpkin arrangement sat in our refreshment area, and went home today with a special friend as a “thank you” for her help this weekend. It will only last a few days, but the joy in making it lasts a life-time. 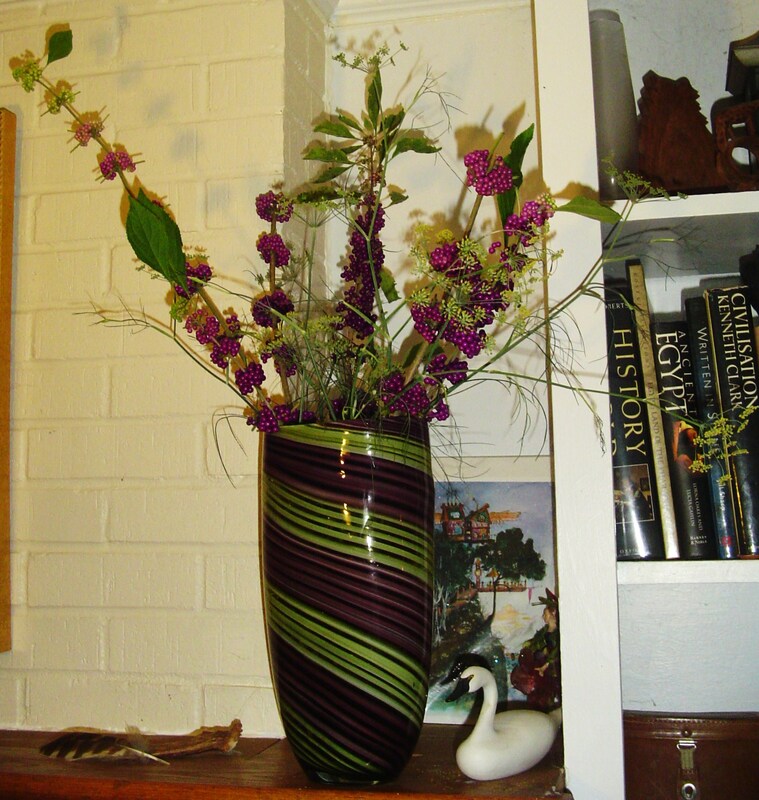 The second arrangement with the dill, for home. Whether you cut a single blossom, or a bouquet, just remember that most plants respond well to “pruning”, and generally give far more flowers over the season when you harvest flowers regularly. Cultivate a “cut and come again” garden with blooms and branches ready for harvest throughout the season. Share with friends, family, your community, and of course, bring the beauty of your own garden into your home as often as you’re able. 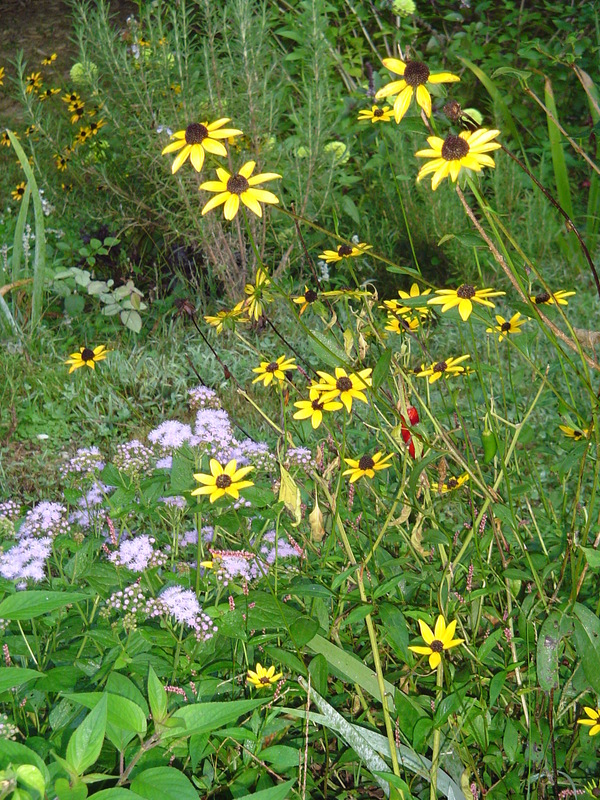 Thank you for the lovely post and the encouragement to bring in beauty from our own backyard. I can’t wait to try the honey tip! You have a lovely blog and I’m enjoying reading your posts. Beautiful. Thanks for the honey snd hot water tip.